New York : Graphix, 2010. 213 pp. Graphic novel. 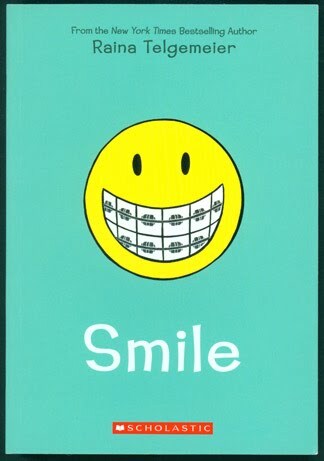 Smile is an autobiographical graphic novel by Raina Telgemeier. As a sixth-grader Raina suffered an unfortunate accident that would affect her life for years to come. Her two front teeth were knocked out, thus beginning an extensive dental/orthodontic/periodontal nightmare. Raine tries to keep an upbeat attitude despite the lack of support she receives from her friends. Never having had orthodontia myself, I wasn't sure I would be able to empathize with Raina's character. I needn't have worried. Raina is a great character who took everything in stride yet was completely believable and realistic. Despite having different issues to deal with, I could totally see myself in some of Raina's situations. A great read with warm and friendly illustrations. Reading Smile was like spending time with a friend from junior high, and don't worry that can be a good thing.